Carlisle Family Dental is committed to Family and Cosmetic Dentistry. Dr. Brandon Allen and Staff welcome you with a caring and compassionate desire to make your visit comfortable. Dr. Brandon I. Allen was raised by a hard working farming family in the foothills of Eastern Oregon. Dr. Allen received his education by attending Weber State University, followed by University of Louisville School of Dentistry. He is married to Jenna Allen and has six beautiful children. Dr. Allen finds passion in Dentistry by exploring new technology and advancements in dental procedures. Jenna Allen grew up in the southeastern community in Bell County. She was raised by a loving, religious, hard working family. She attended University of Kentucky Dental School for a Dental Hygiene degree. 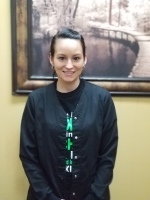 She enjoys being a mother to six and an important part of Carlisle Family Dental. Our Staff are Certified in radiology and have been credentialed as Extended Duty Dental Assistants. They love the patient and always find was to make every visit comfortable and pleasant. Tiffany Kiskaden was born and grew up in Nicholas County. She graduated from Nicholas County High School in 2007. and attended IDT. 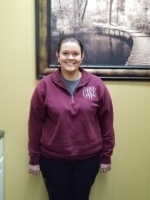 She recieved her EDDA Certification and Joined Carlisle Family Dental. 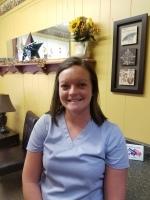 She Loves being a mother to her son Kaden and She loves being part of the Carlisle Family Dental team. Courtney is from Ewing, Kentucky and is a Graduate from Fleming County High School. She attended College at MSU and Maysville Community and Tech School.